Spray at any angle, including upside down! 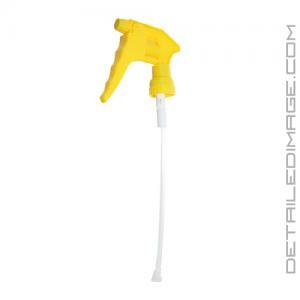 The DI Accessories Upside Down Trigger Sprayer sprays at any angle! 90 degrees, 45 degrees, completely upside down, it does not matter! This makes this trigger the perfect trigger for when you have to maneuver a spray bottle to reach that one tough or tight area. It is perfect for wheel wells, wheels, engine bay, interior carpets, headliner, etc. The nozzle tip allows you to go from a strong stream to a light mist with a simple twist and the comfortable finger grip makes spraying a breeze. 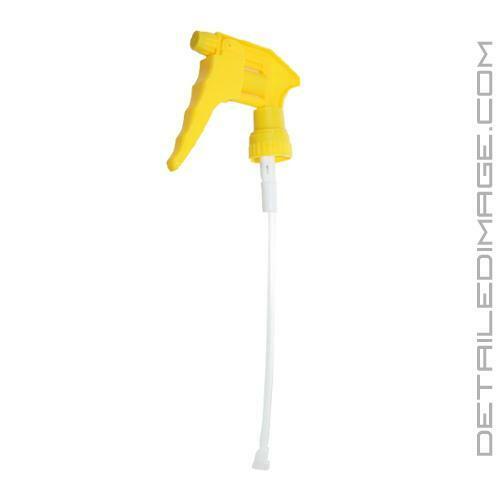 This trigger measures 9 1/4" with a strainer on the bottom, so it works in most spray bottles 16oz - 32oz. You can remove the strainer, trim the trigger, and put the strainer back on to make this trigger fit perfectly to any bottle you have on hand. If you are looking for a trigger that can be sprayed from any angle, the DI Accessories Upside Down Trigger will work great! Been looking for a sprayer that sprays upside down for a long time. This does the job. Have not had for very long so can't tell how long it will last. For the price I bought these at, not a bad deal. But would not pay full price as they drip a heavier product while spraying. Worked great, a must for getting into those hard to reach spots. Haven't used them much as of yet so I can't comment on the longevity of them.